About Jhulan Yatra : Jhulan Yatra is one of the most important festivals for the followers of Lord Krishna celebrated in the monsoon month of Shravan. After Holi and Janmashthami, it is the biggest and most popular religious occasion of the Vaishnavas. Known for its spectacular display of decorated swings, song and dance, Jhulan is a joyful festival celebrating the Radha-Krishna amour coupled with the romantic fervor of the rainy season in India. 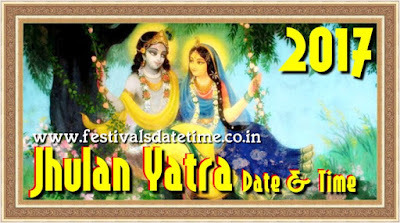 Jhulan Yatra has been inspired from the swing pastimes of Krishna and his consort Radha during their fable romance in the idyllic pastoral groves of Vrindavan, where the divine lovers along with their cowherd friends and 'gopis' took part in joyful swinging in the cool monsoon season.